Managing is a perilous business: how to 'let go' yet stay in touch, how to balance short-term tactics with longer-term strategy, how to motivate people to do more with less, how to 'walk the talk' when you don't feel like it, how simultaneously to be an inspirational leader and an effective manager - the dilemmas are endless. Peter Honey has spent more than 35 years advising managers, from a wide cross-section of functions and organisations, and draws on his experiences in this entertaining, insightful book. 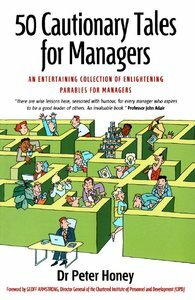 The whole of management life is revealed in 50 short stories, some sad, some funny - all based on real managers and real events. You'll find control-freaks, autocrats, egotists, bullies, perfectionists, ditherers and eccentrics as well as a few managers simply striving to do their best in difficult circumstances. Peter Honey bravely offers each flawed manager practical advice in a bid to improve their performance and make life more tolerable for their colleagues. The result is a realistic, engaging and ultimately effective book from which any manager, at whatever level, can learn a great deal. Dr Peter Honey, regarded as one of the world's leading gurus on learning and behaviour and their application to making people more effective in the work place is best known for the Honey and Mumford Learning Styles Questionnaire that was first published in 1982. Since then, Peter Honey Publications has produced a stream of high quality resources promoting learning for individuals, teams and organisations. Peter also manages to be a prolific author, consultant and speaker. He is based in Maidenhead, Berks.